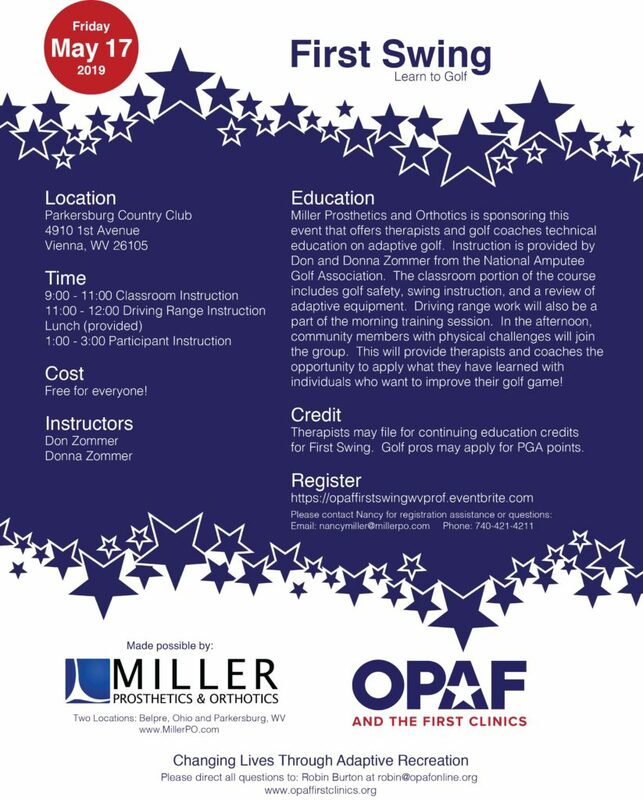 Miller Prosthetics & Orthotics is working with two National Groups: the Orthotic & Prosthetic Activities Foundation (OPAF) and the National Amputee Golf Association (AGA) to bring adaptive golf instruction to the Mid-Ohio Valley on May 17, 2019 at the Parkersburg Country Club in Vienna, WV. The morning session 9:00-12:00 is intended for Physical Therapist and Golf Coaches to learn how to teach adaptive golf. Lunch 12:00-1:00 for therapists, coaches and adaptive golfers will be provided if registered in advance for the event. Registration links below. The afternoon session 1:00-3:00 is for amputees or physically challenged community members to work with the newly trained therapists and golf coaches on learning to golf or improving their swing. If you have limb loss or other physical challenges and would like to improve your golf swing, join us for an afternoon on the driving range. Miller Prosthetics & Orthotics is bringing in coaches from the National Amputee Golf Association and partnering OPAF to provide instruction from the best! All levels of ability are welcome to participate. If you are a novice, discover the game of golf and meet new friends! If you are an experienced golfer, come for technical tips and mentor someone new to the game. Adaptive equipment will be available for use during practice. We will be there rain or shine! Listen to our Radio Ad for the Event! Miller Prosthetics and Orthotics is sponsoring a First Swing Learn to Golf event that offers therapists and golf coaches technical education on adaptive golf. Instruction is provided by Don and Donna Zommer from the National Amputee Golf Association. The classroom portion of the course includes golf safety, swing instruction, and a review of adaptive equipment. want to improve their golf game! Be sure to invite your patients or friends who would benefit from this fun filled day.